I am truly honored today to feature a very special guest, Tammy Fender. 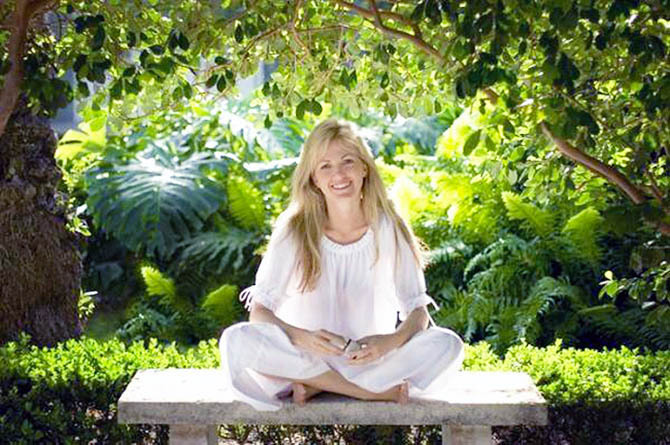 She is the founder of Tammy Fender Skincare, a luxury organic brand that promotes beauty from within by applying holistic principles to skincare formulations. I discovered Tammy’s line thanks to Katey Denno (a celebrity makeup artist). I noticed that Katey would often choose Tammy Fender products to prepare celebrities’ skin before red carpet events. The more I read about Tammy, the more I was fascinated by her, and I am so thrilled to have her as my first guest interview. I hope you all enjoy, and make sure to take notes! Your approach to skincare is deeply connected with your holistic lifestyle. Can you share the guiding principles of your philosophy? My beauty philosophy is rooted in ancient holistic medicine, which teaches that overall well-being is integrated, that wellness encompasses spiritual, emotional and physical health. Looking through that lens, it’s easy to see that what we eat is just as important as what we put onto our skin, and that we need to nourish both our bodies and our souls in order to be well. When I meet with a client, I work holistically, considering imbalances on every plane. In the same way, the holistic lifestyle takes into account the elements that surround us, recognizing the synergistic connection between ourselves and our planet, including, for example, the beautiful plants and flowers we use to make our formulas at Tammy Fender, botanical essences that are bursting with Pure Living Energy. Working in that way, we can share in the beauty, radiance and happiness that can only come from within. Which practical skincare tips do you find yourself giving the most? There are so many simple ways to better care for your skin, including introducing more exercise into your daily routine, encouraging oxygenation and circulation. I also love juicing, which takes advantage of fruits and vegetables in their natural state. And I encourage all my clients to get enough physical and mental rest. My favorite tip, however, is to laugh whenever possible—you’d be amazed how much a little laughter can benefit our skin! What are the foods that you recommend eating for great skin? I recommend a healthy diet that includes foods containing antioxidant-rich Vitamins A and E such as carrots, avocados and almonds. These nutrients are essential for cell repair and help to protect skin against free radical damage, while supporting healing of existing sun damage and offering amazing natural sun protection. Foods containing omega oils, which can help reverse signs of aging and sun damage, are also wonderful for the skin, whether found in walnuts, spinach, flax seed oils or salmon. Which key ingredients in Tammy Fender products are the most beneficial to the skin? There are so many powerful botanical ingredients that benefit the skin, but one of my favorites is Bulgarian Rose, considered to be one of the most valuable essences of all, and requiring more than 7,000 petals to produce a single drop. As an essential oil, Bulgarian Rose has the highest frequency of all, and is a powerful cell rejuvenator, bringing the body and the mind into harmony. I also love to use Helichysum, which has a calming effect, alleviating tension and stress on every level. How does Tammy Fender Skincare differ from other “natural”/”organic” skincare ranges? I like to remember that any beauty product is only as good as its ingredients. At Tammy Fender we are meticulous about what goes in to our formulas, which are hand-blended in small batches. We use 100% plant-based ingredients, including organic herbal infusions, organic plant oils and therapeutic-grade essential oils and natural food supplements, all of which work together synergistically to enhance the skin while restoring balance to the body, mind and soul. Due to their purity, our formulas are easily absorbed by the body at the cellular level, so they offer remarkable benefits. For someone new to your range of products, where should they start? I would recommend our Quintessential Serum, which is such a versatile and powerful formula. It’s full of the kind of super-concentrated nutrients skin simply craves, providing deep moisturizing and replenishing the skin. Combining the strengths of rose, chamomile and frankincense, it also boasts exquisite anti-aging properties, and helps form a protective barrier that guards skin from the elements and from environmental pollutants. Which of your products do you enjoy using the most? Of course, I love them all! One of the most incredible things about our skin is how it consistently changes, regenerating every 27 days or so. Right now I am enjoying the benefits of Capillary Strengthening Blend, which is packed with carrot seed extract, a tremendous natural source of Vitamin A. What is coming up next for Tammy Fender Skincare? We are continually growing as a luxury brand, reaching new global markets and developing exciting products like our recently released Cellulite & Stretch Mark Smoothing Solution, a feather-weight foam which absorbs deep into skin tissues to lift and tighten target areas. Thanks so much to Tammy for answering my questions. I truly enjoyed interviewing her and absolutely love her philosophy on beauty. It is amazing to see that so much love and care are put into each single, hand-blended product. Now I am seriously craving a trip to Tammy’s spa in Florida! I recently started to try some of her products, and they are simply stunning, like Tammy herself. The formulations are so unique and effective. I can’t wait to tell you more about them in the upcoming reviews! If you would like to learn about Tammy Fender’s products you can browse her collection at The Detox Market and SpaceNK.